During the last 10 years, cost pressures and the changing requirements for bioreactors in the modern pharmaceutical industry have resulted in the increased use of disposable bioreactors in both R&D and manufacturing. Numerous studies have demonstrated their efficiency in cell culture-based upstream processing at small- and middle-volume scales. As shown in Figure 1, disposable bioreactors with culture volumes between 10 mL and 2 m3 are most widely used for cell proliferation, screening experiments, the production of therapeutic agents (recombinant proteins, antibodies, secondary metabolites) and the production of viruses for gene therapies as well as veterinary and human vaccines (1,2). The key element of every disposable bioreactor is its presterile cultivation container, which is made of FDA-approved plastics and is only intended for single-use. The cultivation containers (consisting of a multiwell plate, a tube, a flask, a cartridge or a bag) vary in design, polymer type, scale, instrumentation, mass and energy transfer, and power input. Among the multitude of disposable bioreactor types, the category of mechanically driven bioreactors that overcomes the limitations of long-term established static systems (restricted surface for cell expansion and relatively low cell density with low total cell output) has gained in importance in recent years (1). In this article, we focus on common shaken, stirred and wave-mixed systems. Particular attention is paid to the CultiFlask 50 disposable bioreactor, the SuperSpinner D 1000 and the BioWave, as well as its successor, the BIOSTAT CultiBag RM, which have become common devices for process development and scale-up procedures in our cell culture labs. Their effectiveness is illustrated with examples from the literature and our own research. During the last few decades, orbital shaking in non-instrumented disposable containers has become an accepted technology for the rapid development of cell culture processes and seed inoculum production at mL-scale. “Erlenmeyer” flasks (whose engineering principles are better known today) are regarded as reliable devices with which to perform parallel experiments with animal suspension cells in high numbers. Furthermore, the pioneering work of the Swiss Federal Institute of Technology Lausanne and ExcellGene SA supported the introduction of frustoconical shake tubes as suitable cultivation containers for such purposes, which culminated in the development of the TubeSpin cultivation vessel (trade name CultiFlask 50 disposable bioreactor) (3). This bioreactor, which resembles the classic 50 mL centrifuge design, is equipped with a vented screw cap. 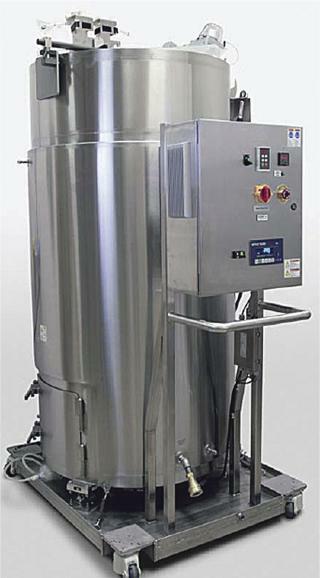 Integrated holes and a PTFE membrane guarantee optimal gas exchange, sterility and minimized liquid loss by evaporation. Presupposing moderate agitation speeds and working volumes, the high cell densities (>1 × 107 cells/mL) that have been reached in CultiFlask 50 disposable bioreactors with a CHO DG44 suspension cell line are comparable with those cell densities that are normally achieved in optimized stirred bioreactors. Thus, it was assumed that the CultiFlask 50 disposable bioreactor ensures a non-limiting oxygen transfer for the growth and production of animal suspension cells. This hypothesis was corroborated by the reported volumetric oxygen mass transfer coefficients (kLa values), which range between 5 and 30 per hour at culture volumes of 10–20 mL, and have agitation speeds between 180 and 220 rpm (4). In our investigations, aimed at analysing growth courses and metabolite profiles of insect suspension cells (Sf21), similar behaviour was detected in CultiFlask 50 disposable bioreactors, 125 mL shake flasks (Corning) and 2 L wave-mixed CultiBags. Under batch conditions and appropriate cultivation parameters, we determined cell densities to be between 1.8 and 2.2 × 107 cells/mL, growth rates to be between 0.031 and 0.033 per hour, doubling times to be between 21–22.1 hours, glucose uptake rates to be 0.48–0.61 × 10-17 mol/cell/s, and glutamine uptake rates to be between 0.11 and 0.2 × 10-17 mol/cell/s (5). 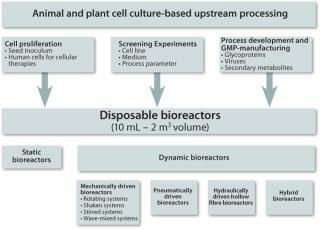 Moreover, comparative expression studies with the aim of producing the catalytic domain of B-Raf kinase showed similar results (personal communication, C. Ries) and revealed TubeSpin technology’s potential applicability in scaling-up the culture volume, even if different cultivation systems are used. Thus, these findings suggest the high suitability of CultiFlask 50 disposable bioreactors as scale-down systems for serum-free cultivated insect suspension cells, which are frequently employed to generate tool proteins and new vaccines in conjunction with baculovirus expression vector systems. SuperSpinner D 1000 case study: In contrast to previously described shaking bioreactors, which have no internal elements, stirred bioreactors are equipped with a rotating or tumbling impeller that ensures mass and temperature homogeneity, as well as gas dispersion. Whereas in magnetically driven non-instrumented stirred bioreactors — so-called spinner flasks — surface aeration is typically accomplished, aeration is effected by a tumbling hollow fibre membrane in the disposable SuperSpinner D 1000. The underlying idea of bubble-free aeration by a hollow fibre membrane wound around a tumbling impeller was elucidated in the early 1990s by Lehmann et al. and resulted in the development of SuperSpinners made of glass (6). Owing to the opportunity for membrane aeration, kLa values about 3.5 times higher than in standard spinners have been estimated (7). These values correspond with volumetric oxygen mass transfer coefficients determined for membrane aerated stirred cell culture bioreactors at laboratory scale. Consequently, SuperSpinners should provide higher cell densities than surface aerated standard spinners, which are principally used for the expansion of animal suspension cells. Cell densities that were two to three times higher than in standard spinners were guaranteed by the disposable SuperSpinner D 1000 for two CHO suspension cell lines (CHO DG44 ST1-C6, CHO XM 111-10) that have been grown, serum-free or chemically defined, in batch mode at culture volumes of 0.8 and 1 L (8,9). From a comparison of standard spinners and SuperSpinner D 1000 results, the same trend was observed for murine hybridoma cells cultivated in feeding mode at culture volumes up to 800 mL (8). Finally, serum-free batch cultivation of Sf9 suspension cells (1 L culture volume) in the SuperSpinner D 1000 resulted in high cell densities after only 3 days of cultivation. The maximum cell density achieved, 1.66 × 107 cells/mL is, again, about three times higher than those observed in standard spinners, and is similar to typical cell densities obtained in wave-mixed bioreactors (9,10). These results suggest that the SuperSpinner D 1000 can even be used for the production of protein samples for clinical trials. In the case of wave-mixed bag bioreactors, the rocking movement of the bioreactor’s platform containing the flexible culture bag facilitates mixing. In this way, the surface of the culture medium is continuously renewed and a bubble-free surface aeration takes place. Mass and energy transfer in wave-mixed bioreactors, and therefore their growth and product formation efficiency, are highly dependent on wave development and propagation. Both features are mainly influenced by the rocking rate, rocking angle, filling level, bag geometry and culture broth viscosity. BioWave, BIOSTAT CultiBag RM (see Figure 2), Wave Bioreactor, AppliFlex, Tsunami Bioreactor, CELL-tainer and Wave and Undertow Bioreactor belong to the group of wave-mixed bag bioreactors. Despite their identical working principle, major differences affect their control unit, platform movement and culture bag design (material, scale, dimension, instrumentation with sensor probes and filters). Like Wave Bioreactor, BioWave and BIOSTAT CultiBag RM originated from the first prototype of a wave-mixed bag bioreactor and is characterized by a one-dimensional rocking movement. Modified Reynolds numbers (characterizing the fluid flow), mixing times, residence time distribution data, volumetric oxygen mass transfer coefficients and values for specific power input have demonstrated the comparability (and sometimes superiority) of the BioWave and BIOSTAT CultiBag RM with surface or bubble-free aerated cell culture bioreactors made of glass or stainless steel (10). Hence, their prevalence in small- and middle-volume-scale processes based on animal and plant cells with low oxygen demands is easy to explain. The cultivation overview presented in Table 1 clearly indicates the popularity of wave-mixed CultiBags operating in batch, feeding or perfusion modes and allowing the online control of pH and dissolved oxygen via optical sensors. Table 1: Overview of animal and plant cell cultures successfully grown in wave-mixed CultiBags. Independent of the cell culture type, encouraging cultivation results have been described for wave-mixed CultiBags in which biologically active cells, recombinant glycoproteins, virus vaccines and secondary metabolites were produced in cultures of up to 100 L (2, 10,11,12,13,14,15,16,17,18,19,20). Even plant cell cultures, which tend to aggregate and become increasingly viscous during cultivation, have been grown up to high biomass concentrations (2,18,20). To achieve successful scale-up, a guarantee of similar fluid flow conditions and an optimal oxygen supply — independent of scale — is recommended for wave-mixed culture bags in general (10). In the future, it is expected that CFD models will identify local velocity and concentration profiles in extant wave-mixed culture bags to support their use in scale-up and will make comparisons with stirred and shaking cultivation containers possible. In summary, the CultiFlask 50 disposable bioreactor, SuperSpinner D 1000, BioWave and BIOSTAT CultiBag RM have been very successful in growing cell cultures and expressing their products. Although they differ in scale, design, working principle and instrumentation, they all provide excellent cell growth and comparable or even higher cell numbers and product yields than their counterparts made of glass or steel. 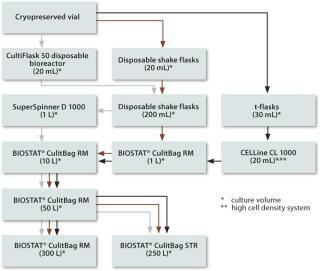 In addition, their availability enables the design of completely disposable upstream processes, as shown in Figure 3 and as realized in our cell culture labs. We would like to mention that, in addition to the BIOSTAT CultiBag RM, the corresponding BioWave or Wave Bioreactor and the AppliFlex can also be used. It is also possible to replace the recently introduced BIOSTAT CultiBag STR with ThermoFisher’s well-established SUB, Xcellerx’s XDR-Disposable Stirred Tank Bioreactor or Artelis-ATMI Life Sciences’ Pad-Drive disposable bioreactor. In doing so, the special features of the respective bioreactor type have to be taken into account (1,10,21). Because of the demands of the market, it is even expected that the increase in use of disposable bioreactors for cell culture-based processes will continue in the future. Moreover, in personalized medicine, where ex vivo generated functional human cells (including stem cells) in clinically relevant numbers are required, disposable bioreactors with a culture volume between 1 L and 1000 L will become a necessity. Lastly, there is evidence of an expansion of the already existing small number of microorganism-based applications (such as microbial immunomodulator secernation and the production of chiral building blocks and biological insecticides by the in vitro cultivation of fungal species) with disposable bioreactors (10). Selecting the most suitable disposable bioreactor type and, thus, the decision to shake, stir or rock the disposable cultivation container is dependent on the cultivation task, the production organism and its characteristics, the scale, the legal regulations and, finally, the infrastructure and know-how of the user. Interestingly, for biomanufacturing processes with culture volumes greater than 500 L, only stirred versions of disposable bag bioreactors (1000 L SUB [Figure 4] and 1000 L/2000 L XDR-Disposable-Stirred Tank Bioreactor) are available to date. They are basically equipped with microspargers or sparger rings and rotating axial flow impellers. Whereas bottom-driven XDR-Disposable Stirred Tank Bioreactors operate with a magnetically coupled impeller, SUBs are top-driven and have mechanical seals. The cylindrical culture bags are always shaped and fixed in customized steel support containers, allowing the sterile insertion of standard sensors for IPC. However, in addition to further stirred bag bioreactors, 1800 L bag bioreactors with Vibromixers (Zeta) and 2000 L bag bioreactors that apply a buoyant force of inlet gas to pneumatically power mixing using air-wheels (PBS Biotech) have also been announced. 1.) Eibl, R., and D. Eibl. 2007. 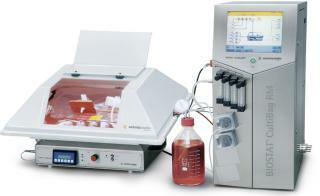 Disposable Bioreactors for Cell Culture-Based Bioprocessing. ACHEMA Worldwide News 2:8-10. 2.) Eibl, R., and D. Eibl. 2007. Design of Bioreactors Suitable for Plant Cell and Tissue Cultures. Phytochem. Rev. 7:593-598. 3.) De Jesus, MJ. 2004. TubeSpin Satellites: A Fast Track Approach for Process Development with Animal Cells Using Shaking Technology. Biochem. Eng. J. 17:217-223. 4.) 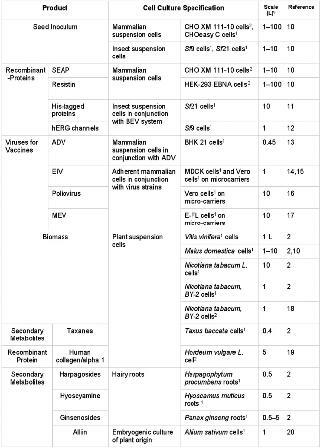 Wurm, F. 2007.Novel Technologies for Rapid and Low Cost Provisioning of Antibodies and Process Details in Mammalian Cell Culture-Based Biomanufacturing. Presentation at BioProduction, Berlin. 5.) Ries, C. 2008. Kultivierung von Sf-21 Zellen im CultiBag, Schüttelkolben und CultiFlask Bioreaktor. Scientific Report, Zurich University of Applied Sciences, School of Life Sciences and Facility Management, Institute of Biotechnology. 6.) Lehmann, J. 1992. Der Superspinner – Ein Brutschrankfermenter für die Massenkultur tierischer Zellen. BioEngineering 5/6:36-38. 7.) Heidemann, R. 1994. The Super-Spinner: A Low Cost Animal Cell Culture Bioreactor for the CO2 Incubator. Cytotechnol. 14:1-9. 8.) Schmale, K. 2008. SuperSpinner D1000: Efficient Cell Cultivation for the Lab-Scale Production of Biomass and Recombinant Proteins”. Nat. Methods 5:Application Notes. 9.) Bauer, I, and L. Lisica. 2008. Zellkultivierungen im Disposable SuperSpinner D1000. Protocols, Zurich University of Applied Sciences, School of Life Sciences and Facility Management, Institute of Biotechnology. 10.) Eibl, R. in press.Bag Bioreactor Based on Wave-Induced Motion: Characteristics and ApplicationsDisposable Bioreactors, Advances in Biochemical Engineering/Biotechnology, Springer-Verlag, Berlin. 11.) Schlaeppi, JM. 2006. A Semi-Automated Large-Scale Process for the Production of Recombinant Tagged Proteins in the Baculovirus Expression System. Protein Expres. Purif. 50:185-195. 12.) Zbinden, E. 2008. Untersuchungen zur Insektenzellkultur-basierten Expression von hERG-Proteinen in Schüttelkolben und einem wellendurchmischten Einwegbioreaktor, Bachelorthesis, Zurich University of Applied Sciences, School of Life Sciences and Facility Management, Institute of Biotechnology. 13.) Slivac, I. 2006. Aujeszky’s Disease Virus Production in Disposable Bioreactors. J. Biosci. 3:363-368. 14.) Genzel, Y. 2006. Wave Microcarrier Cultivation of MDCK Cells for Influenza Virus Production in Serum Containing and Serum-Free Media. Vaccine 24:6074-6087. 15.) Dietzsch,. 2007.Vero or MDCK Cells for Influenza A Virus Production in Microcarrier Systems? Poster presentation at European Bioperspectives, Cologne. 16.) Schouwenberg, J, and T. van der Velden-de Groot. 2007.Vaccine Production Utilizing the Potential of Microcarriers in Disposable Bioreactor. Poster presentation at ESACT, Dresden. 17.) Hundt, B. 2007. Establishment of a Mink Enteritis Vaccine Production Process in Stirred Tank Reactor and Wave Bioreactor Microcarrier Culture in 1–10 L Scale. Vaccine 25:3987-3995. 18.) Nieger, K. 2008. In vitro Kultivierung einer Antikörper produzierenden Tabaksuspensionszelllinie in gerührten und wellendurchmischten Einweg-Systemen, Bachelorthesis, University of Applied Sciences Anhalt, Department of Applied Biological Sciences and Process Techniques. 19.) Ritala, A. 2008. Production of a Recombinant Industrial Protein Using Barley Cell Cultures. Protein Expres. Purif. 59:274-281. 20.) Eibl, R, and D. Eibl. 2006.Design and Use of the Wave Bioreactor for Plant Cell CulturePlant Tissue Culture Engineering, Springer-Verlag, Berlin:203-227. 21.) Eibl, R, and D. EiblApplication of Disposable Bag-Bioreactors in Tissue Engineering and for the Production of Therapeutic Agents Bioreactor Systems for Tissue Engineering, Advances in Biochemical Engineering/Biotechnology, Springer-Verlag, Berlin.